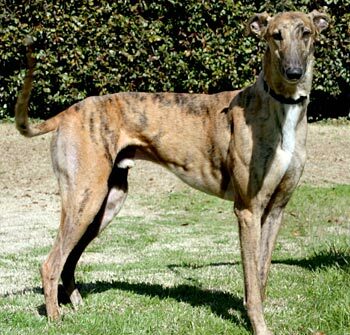 Tony, aka Playnumberstony, is a handsome, almost 3-year-old brindle male born May 5, 2007. His sire is the Irish born Pacific Mile, and his dam is Oneco Hazelnut, making his sibling GALT's own David. 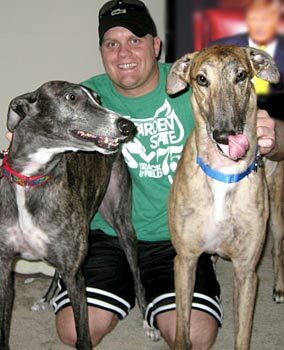 Tony’s racing career consists of 21 races, starting May 12, 2009, at Flagler in Miami, FL, and ended there on October 17, 2009. 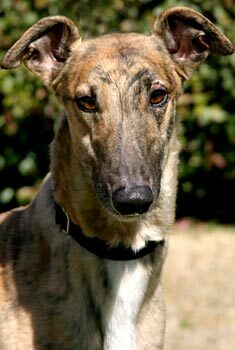 Tony is one sweet, loving boy, and he is ready to find his forever family! Tony is not cat or small animal tolerant. 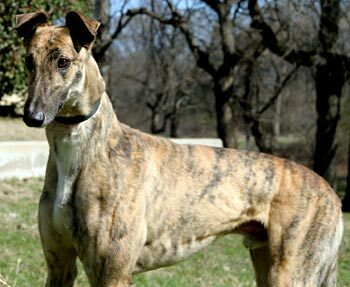 Tony the tiger-striped brindle is a big, relaxed, confident boy. He is a snuggle-bug and wants to lay close to his foster siblings or his people. The couch is off-limits or he'd be right up there with his head in your lap! Tony has learned to be a good house resident. He knows to do his potty business outside. Food on the counter tops is still pretty interesting, but he no longer puts his paws up to investigate, and he's learning that it all belongs to the humans and not to him. Tony hasn't chewed on any inappropriate items and doesn't try to get on the furniture. This big boy loves mealtimes and runs into his crate when you head that direction with his bowl, after he bounces in excitement a couple of times. Tony crates very well. But if he knows you're in the house with him and he can't see you, he'll remind you that he's waiting to be let out so he can join you. He likes to collect toys in his crate. He loves squeaky toys, but isn't too hard on them and has not forced retirement on any so far. Tony remains calm when petted by excited children. His ears perk up when he sees other dogs on leash and he'll try to pull you over to greet them properly. Other than that, he's a pretty good walker and minds well. Tony has met large and small dogs politely on leash. He's the first one to jump up and follow me around the house. He'll often lay down on the bath rug while I'm taking a shower just to make sure I don't disappear out a hidden trap door. Tony likes to stretch out on his back, and always enjoys getting a good belly rub while he's there. Come meet this lovable, easy-going boy soon! Tony with his new family!